Buffalo Bayou Park offers trails leading to downtown Houston. HOUSTON – (Realty News Report) – Flowing east some 53 miles from Katy through the Port of Houston and Houston Ship Channel into Galveston Bay and onto the Gulf of Mexico Buffalo Bayou has played an important part in Houston’s history ever since the Allen brothers founded the city nearly 200 years ago. The 160-acre Buffalo Bayou Park is one of the country’s great urban green spaces and received Urban Land Institute Houston’s 2017 Development of Distinction Urban Open Space Award. Built through a public-private partnership, the $58 million undertaking was financed in part by a $30 million donation from the Kinder Foundation. But Hurricane Harvey caused major damage to Buffalo Bayou Park. At the Shepherd Drive Bridge, water rose to 38.78 feet inside the Park. While Buffalo Bayou Park was designed to flood, no one anticipated three historic flooding events in 18 months. To find out how BBP is doing a year after Harvey hit – and where it’s going in the next few years — Realty News Report talked with Anne Olson, President of Buffalo Bayou Partnership (BBP), an organization overseeing revitalization activities along Houston’s Buffalo Bayou. 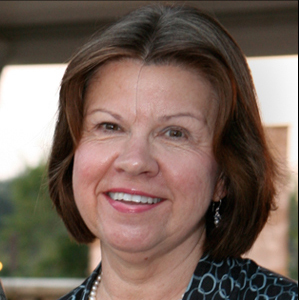 During her tenure, Anne and the BBP board have raised an impressive $200 million for the waterway’s redevelopment. Realty News Report: Hurricane Harvey was a devastating blow to Houston, including Buffalo Bayou Park. Can you tell us about the extent of the damage and the progress of repairs? Anne Olson: Hurricane Harvey had a significant impact on Buffalo Bayou Park. It really was a tale of two parks. The upper portion of the park looked almost the same a few days after Harvey and people were out and about walking and biking. The lower section of the park, however, did not fare as well. Much of this can be attributed to the banks being under water for six weeks as the Army Corps released water from the reservoirs. Following Harvey, we hauled off over 60 million pounds of sediment, planted approximately 400 trees, repaired footpaths and renovated the popular dog park. Our work continues. We will continue to repair the footpaths and plant additional trees. In addition, the Harris County Flood Control District will be repairing major erosion in the park and removing sediment. In the agreement we have with the Flood Control District, they are responsible for areas in the park where they worked during construction. We also hope to receive County bond funds to start restoring the riparian edge along the bayou. Realty News Report: The heavy rains on July Fourth wiped out the Freedom of Texas festival for the first time in 31 years. As these massive storms seem to be more common, what do you say to critics who think that maybe Buffalo Bayou isn’t a good place for a park after all? Anne Olson: Our bayous act as flood detention areas when they are needed. When they aren’t being used for this, they provide enormous recreational opportunities and benefits for our community. When we built the park and developed our maintenance plan, we took into consideration the fact that we would have major storm events. Of course, we could have never anticipated that Houston would experience the heaviest rainfall in our country’s history! In addition to having the necessary resources to maintain the park, we have a great park crew that has a system down when the flooding events occur. Realty News Report: Flooding is certainly a crucial issue facing our city. As someone who has focused a lot of energy on the bayou for a number of years, could you share your observations or suggestions? 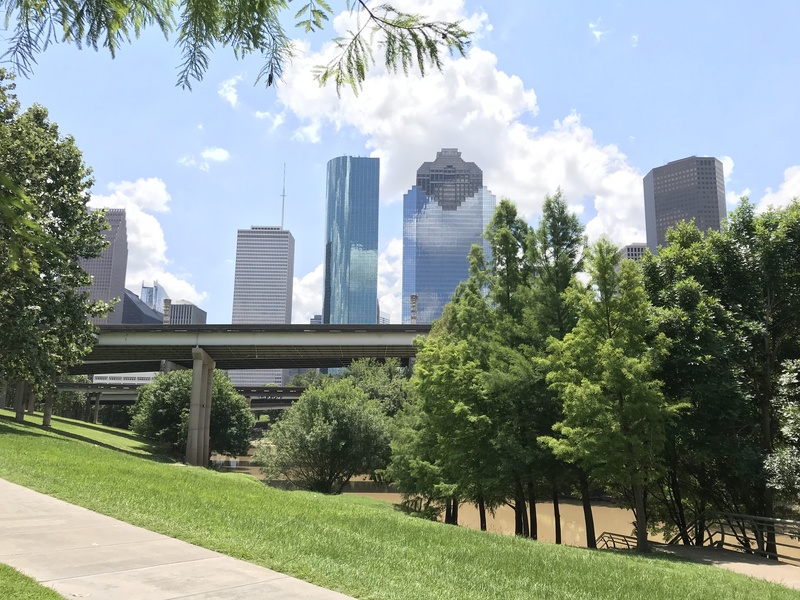 Realty News Report: Buffalo Bayou Park (BBP) on the west side of downtown has been a transformative development unfolding over the last five or 10 years. What’s next? Anne Olson: Buffalo Bayou Partnership currently has several projects and initiatives that are underway for the future revitalization of Buffalo Bayou. In downtown, we are making plans to extend the bayou trail from Allen’s Landing to US 59 where it will join a trail currently under construction by TxDOT at the Houston Housing Authority’s Clayton Homes facility. We also have a major planning project underway along the bayou’s East Sector. We have spent the past year gathering input from neighborhood residents and stakeholders as to what they would like to see along this stretch of the waterway. The final plan will be completed by the end of the year. Realty News Report: Midway’s 147-acre East River development, planned for the former KBR site just east of downtown, has over a mile of bayou frontage. How will this new project impact what will happen with bayou improvements? Anne Olson: BBP has a trail easement along the East River site. We hope to be able to work with Midway to develop this trail in the near future. This is a very critical missing link in the bayou’s comprehensive trail system. Realty News Report: For newcomers to Houston, can you recap the highlights of what has been accomplished in the $58 million development of Buffalo Bayou Park, which includes hike and bike trails and pedestrian bridges? Thousands of Houstonians attend festivals at Buffalo Bayou Park. Anne Olson: Buffalo Bayou Park is full of amenities for park users. In addition to the trails and footpaths, we have a children’s play area, dog park, and two visitor centers that house canoe/kayak and bike rentals. The Lost Lake Visitor Center also has a café, The Dunlavy, and the Wortham Insurance Visitor Center houses the Cistern, a unique underground space that was formerly used to hold Houston’s drinking water. We have converted it into a space where we have art installations. Thousands of people from all over the world have toured the Cistern. 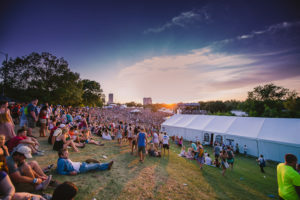 Besides offering amenities for active uses, the park has beautiful areas where visitors can get out in nature, have a picnic, and view Houston’s amazing downtown skyline. It is truly a park that offers something for everyone. Realty News Report: In terms of consumer response has anything in the park surprised you – something that has been more popular than you expected? Anne Olson: We expected the dog park to continue being popular. Houstonians have been bringing their dogs to the park for a very long time, so we knew they would continue to use the space in increasing numbers. It has been surprising to see how the park has attracted Houstonians from all walks of life. It’s definitely been embraced by a cross section of Houston’s population – young and old, all different nationalities, etc. I’m always amazed when I walk the park and hear all the different languages being spoken. Realty News Report: The bayou runs through Memorial Park, where a major redevelopment is planned. How could the bayou be addressed in the Memorial Park improvement project? Anne Olson: Memorial Park’s master plan is very focused on conservation. As a result, the plan does not recommend a trail along the bayou’s edge. I believe the Memorial Park Conservancy team would like to do riparian restoration along the bayou. They definitely see the bayou being very natural.